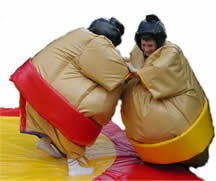 Hilarious fun filled Sumo Wrestling for teens & adults!! Two suits simply pop over your heads, then you're transformed into Sumo Wrestlers! 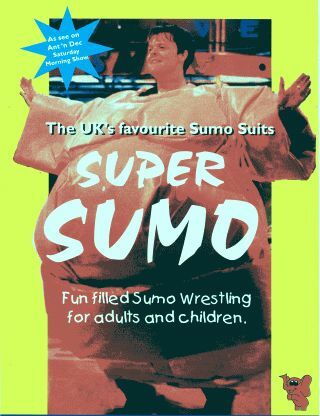 Super Sumo as seen on 'Big Brother' and Ant & Dec's Saturday morning show! The object of the game is to push, trip or throw your opponent out of the circle. (The well padded thick combat mat). Super Sumo is easy to use! Great Fun! For Wrestlers! and The Audience! Sumo mat supplied for bouts. 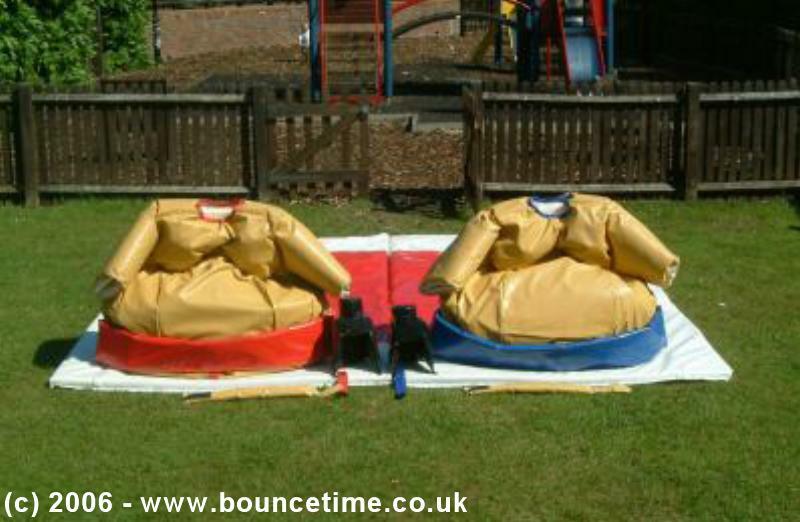 The Sumo Suits & mats must not be used outdoors in wet weather conditions. The Sumo Suits & mats must be stored in a dry location when hired overnight. In the event of a shower during your event the suits & mats must be removed to a dry location. The Sumo Suits must not be allowed to get wet. Overnight Hire Available A deposit is required for overnight hires, which is fully refundable providing the equipment is found to be in a clean, dry, damage free & proper order. AS SEEN ON Ant 'n' Dec's TV SHOW! & Big Brother! (w)14ft x (d)14ft to allow for the safety mats. © Copyright 2006 - 20011 Bounce Time. All Rights Reserved.